Yes, last week I went to the dogs. To be more specific (and less annoyingly devoted to a rather mediocre play on words) I attended an evening of greyhound racing. Similar to horse racing, with the obvious exception that there are no jockeys (not even very tiny ones), greyhound racing was most popular in the UK immediately after WWII, especially among working class men. Its popularity has declined since then, and I'd describe it as a niche sport these days. I went with a group of hashers on a Friday night for an evening of fun, beer, betting and general distraction from the dark chill that has descended since the clocks changed back. Greyhounds are remarkable creatures. The second fastest land animals on the planet, they can reach speeds faster than 40 mph in about six strides (cheetahs get up over 70 mph!). Because greyhounds are sighthounds - dogs that chase their quarry by sight, as opposed to scenthounds who track by scent - they are encouraged to run around the 480 metre long oval track by chasing an artificial motorised "hare" that travels the outside of the course. (Hounds, a hare and beer - it was the perfect activity for hashers!) Each dog start the race inside a trap, which is less devious than it sounds. Just like the starting gates in horse racing, the traps are a way of keeping the dogs segregated and even, and open just as the hare passes them. A typical race features six dogs and lasts about 30 second and where I went they run 13 races per evening, two night a week. Here they come! They're so fast it's pretty much impossible to get a good photo. At least not with my camera (or my level of commitment to standing outside in the cold at a dog track). The track I went to is on the edge of Wimbeldon (the uncharitable would say it's really closer to Tooting, but who's counting?). It features a cunningly well-hidden entrance which requires an almost complete lap around the exterior of the stadium through a dark and deserted parking lot which is not exactly the warm and family-friendly intro that might bring greyhound racing back into the mainstream. To be fair, the dog people are actually trying to promote the sport and get people in the doors, as evidenced by an offer of free admission and racing program to anyone with an Oyster card (which in London is basically anyone with a pulse). The spacious and well-appointed punters area. Going to the greyhounds races is a lot like going to any kind of stadium event - a bit chilly, a bit exciting and with lots of slightly overpriced mediocre beer, burgers and chips - but with the added excitement of betting! Now that I'm a veteran of betting on the races, I was well-equipped to have a flutter on the dogs. And with a total of thirteen races there were plenty of chances to lose money in different and arcane ways. 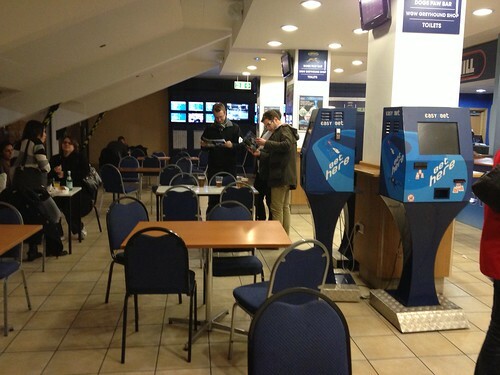 There are two systems of betting at the dog track. Most people bet on the totes, which is a system where the total amount bet by everyone (minus taxes and the house's take) is divided equally among everyone with a winning bet. 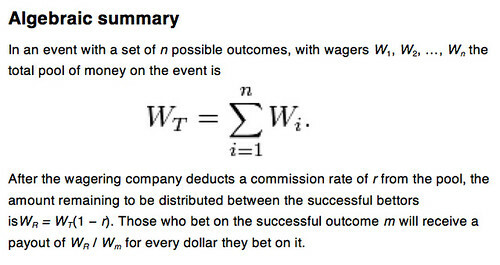 This system is known as "parimutuel" or "totaliser" betting, but the cool kids just call it the totes. The desk for placing tote bets and picking up your winnings. The other way of betting on the dogs is with proper real live bookies who wear flat caps and stand next to the track with fists full of cash and boards displaying the odds, which they update themselves. The minimum bet with these guys was £4-5, and their odds are fixed. If it's 4:1 when you place your bet with a bookie and your dog wins, you get four times your stake. Simple. 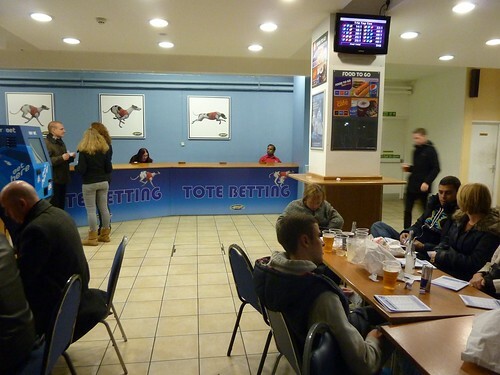 Nonetheless, most of us stuck with the totes where the minimum bet for a win/place was just £2. See! They really do wear flat caps! So how did I do? Well it turns out that I am basically the Greyhound Whisperer because in the first six races of the night I placed a winning bet SIX TIMES. Yep, I won every race. However, lest you think that I walked away with enough money for new Kia and a time share in Majorca, let me assure you that my system was not exactly paying out millions. In fact, after those first six races I had made a grand total of £6.60 in profit. 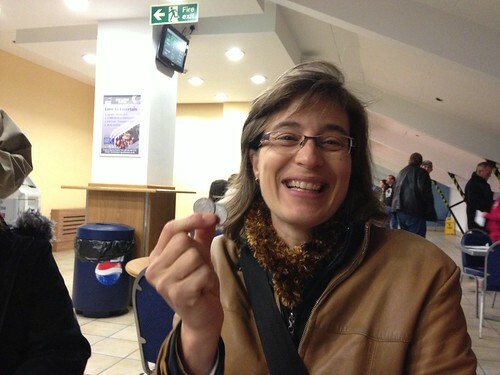 Me with my winnings on the first race. 20 pence! Why did I win so little? Mostly it's because I was only betting the minimum £2 each time. Also, I was betting on a single dog to win OR place (come first or second) and when you hedge your bets like that the payout is lower. Most importantly though, I always always always bet on the favourite, as determined by which dog was displaying the closest - and therefore least profitable - odds. So while others were picking a dog whose name they liked, or one who'd finished in the top one or two in previous weeks, or was running from a particular trap, I just bet the odds. I was playing the long game. Then again, I did end up down £2.20 by the end of the night, but that was entirely because I foolishly abandoned the system on the last race and placed two £2 bets instead of one. If I'd controlled this reckless behaviour I would have ended up 80 pence in the black. 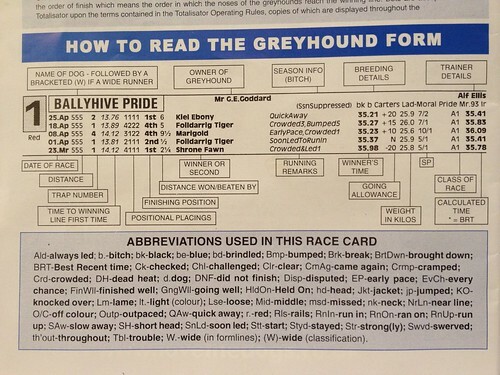 Also, my system avoids the necessity of reading the racing form, which is so complex and arcane that they need to publish this How-To guide inside the front cover. I watched two different documentaries on dog racing, one from the BBC produced in 2001 and one from Channel 4 produced in 2007. 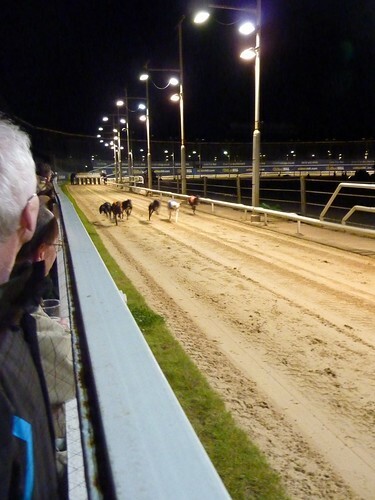 The Channel 4 offering was a look at the famous old dog track in Walthamstow which ceased operation in 2008. Featuring a bookmaker, a professional gambler, some regular punters and a couple who own and race dogs, it painted a rosy and nostalgic picture of life at the dog track. The dog owners were especially lovely, shown feeding their greyhounds steak and vegetables while they were eating beans on toast, and lavishing their four-legged family with love and attention. Sadly, this kind of treatment is probably the exception, especially for dogs owned by larger kennels. And because a greyhound's life expectancy is about fourteen years while their racing career usually only lasts about four, they quickly become an unprofitable liability to their owners once retired. The BBC documentary estimated that 10,000 dogs a year were retired from racing (probably fewer now that the sport has declined) and though greyhound rescue organisations are active in the UK, they are often overburdened and only manage to save about one in four dogs (based on figures from 2007). The rest are euthanised so that's, you know, less than ideal. The other sad fact of life for a racing greyhound is that it seems some (perhaps many) of the races are fixed. This can be accomplished by actually doping the dogs - giving drugs to speed up one dog, or slow down the others. This practice must be less prevalent now that anti-doping testing is the norm at tracks regulated by the Greyhound Board of Great Britain, but races at unregulated independent arenas ("flapping tracks") are easier to fix. And even where drug-testing is used, it's possible to fix races in less detectable ways. For instance, overfeeding a dog and therefore slowing it down before a trial that determines in which heats it will race puts the sluggish and overfed dog in a heat with naturally slower dogs so that it can fly past the rest of the pack on a night when it hasn't had too much dinner. This practice, referred to as "putting on the brakes" isn't just illegal, it's also dangerous to the dogs, who can suffer painful and sometimes fatal gastric torsion. 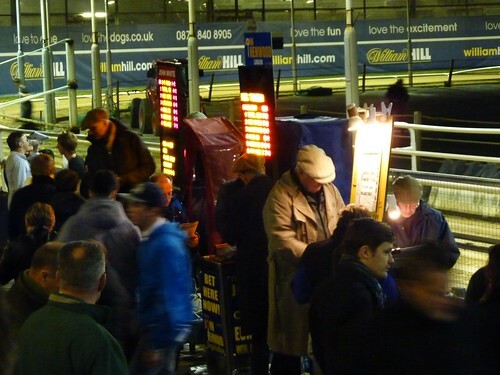 It's all kind of seedy, as evidenced by this anecdote from my night of racing, which certainly made me think twice: On the last race of the night my friend Phillip decided to put £5 on a dog with one of the professional bookmakers trackside. He had his eye on a certain greyhound and approached the bookie to lay his bet, but before he could do so he was elbowed aside by a guy who placed a bet of more than £100 on a different dog. Phillip, sensing that Mr. Pushy knew something he didn't, wisely put his fiver on the same dog as the high-roller and walked away with £25 when the race was over. Fishy? It sure looks that way. Another friend reported that he'd had a mate who owned a dog when in university and was informed by the other owners at the track where he raced that his dog would be allowed to win every eight weeks. So it seems all is not exactly one hundred percent above board at the old dog track. Proponents of the greyhound racing point out that proper racing tracks enforce strict guidelines about the welfare of the dogs. Opponents cite case after case of abuse or neglect and you can find pages and pages of stuff on the internet on both sides of the topic. It's all very much like the Grand National in some ways. The danger to a horse in the Grand National (that I blogged about in the spring) is more obvious and dramatic than the behind-the-scenes neglect or abuse of racing greyhounds. Still they're both, at their core, a pastime in which humans use animals for amusement and if that's something that makes you squirm in your seat then you should probably give the greyhound track a wide berth (probably along with the burger stand). As for me, I suspect I've spent my first and last night at the dog track. The evening was fun, sure, but it's a sport with a chequered past, and one that's definitely on the way out. Where hundreds of dog tracks across the UK used to provide entertainment for thousands upon thousands of average punters, now just 29 registered tracks and 14 flapping tracks are still in operation. Much of that decline is down to the immeasurably greater entertainment options available now. 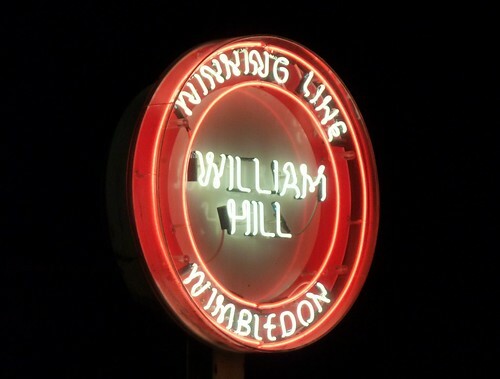 As the old bookie in the Channel 4 documentary said, "When I was a youngster we had dog tracks, we had dance halls, and we had cinemas, that's all we had. Today we've got everything you can think of." So it seems a night at the dog track is a dying past time, which may not really be a bad thing.